President Obama was interviewed prior to the Super Bowl on Sunday, and spent most of his time defending his actions while avoiding directly answering O’Reilly’s questions. 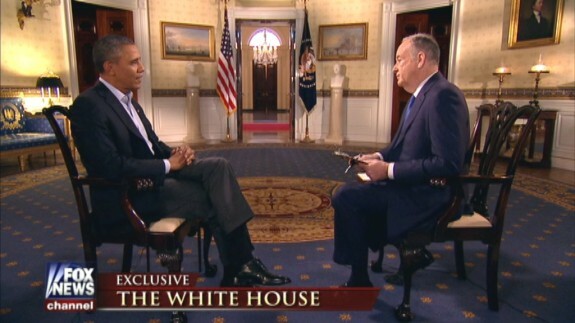 During the extended interview which was taped, O’Reilly asked Obama if he thought he had been unfair during the live interview and Obama answered in the affirmative. Absolutely, of course you are, Bill. But I like you anyway. O’Reilly then asked him in what way was he unfair. We just went through an interview in which you asked about health care not working, IRS, were we wholly corrupt, Benghazi. Uh, what did he expect? Questions about Michelle’s 50th birthday or what Sasha and Malia will do after Obama leaves the White House? The questions that O’Reilly asked were ones that his administration has tried to avoid directly answering because they don’t have a good answer and it exposes the web of lies that the administration has been hiding behind. O’Reilly did what he had to do and he was both respectful and fair. The left thinks otherwise which only reinforces this as they were squirming along with Obama. As a matter of fact O’Reilly could have been tougher and dug deeper, but he didn’t and that’s okay because he still made Obama uncomfortable which everyone who watched could see.